If you were the victim of a car accident in Arkansas, we understand that hiring a lawyer for your personal injury may seem like a daunting decision. How can you know whether your injuries call for legal representation? Once you do decide to call a trusted personal injury attorney, what can you expect from them? What happens if the insurance company won’t negotiate, and you need to file a lawsuit? You’ll find the answer to those questions in our Hiring a Lawyer 101, 102, and 103 series. Each article gives you the tools to choose a lawyer and file a personal injury claim with confidence. Below you’ll find a brief recap of each; be sure to click over and read the full post for more details! Hiring a Lawyer 101: Should You Call a Lawyer? You have serious injuries or significant medical bills from the accident. You will need ongoing treatment or future surgery for your injuries. The insurance company has denied your claim. You received a settlement offer from the insurance company, but it’s lower than your damages and lost wages. The other driver has denied fault, or it’s unclear which driver is responsible for the wreck. There are complicated circumstances surrounding the accident, like pre-existing injuries or questions about insurance coverage. It’s been more than a year since the accident and your claim has not been settled. You’re unable to work and have lost wages. At Taylor King Law we offer FREE, no-obligation case evaluations, so you truly have nothing to lose. Hiring a Lawyer 102: What Happens After I Hire a Lawyer? The vital first step: Gathering information. From tracking down police reports to asking for any photos you took at the scene or gathering witness statements, these pieces of the puzzle will help establish fault in the accident. The second step often surprises clients: You need to be released from treatment by your doctor before your attorney will make any settlement demands. If your attorney began negotiations while you were still treating for injuries, you might not fully recover your medical costs. Next comes the process of gathering other documents and records: lost wage forms and medical reports, records, and bills. This part takes time. Your attorney will send a settlement demand, along with all of the records and bills, to the insurance company. After that, the ball is in the insurance adjuster’s court, and you’ll wait for your lawyer to receive their settlement offer. Negotiations begin next. Your attorney will keep you informed of every settlement offer you receive. He or she will discuss each settlement offer from the insurance adjuster and recommend whether you should accept or reject the offer. Ultimately, the decision is yours. If, after negotiating, you are unable to reach a fair settlement agreement, your attorney will discuss the option of filing a lawsuit. Do you have a solid case, likely to receive a favorable ruling from a judge? Will the court fees and time invested be worth the possible settlement? If you answered “yes” to the above questions about filing a lawsuit, this third installment is for you. “Litigation” simply means “the process of taking legal action.” It begins with your attorney filing the lawsuit.From there, you’ll proceed to the discovery stage, which involves 1) disclosure, 2) interrogatories, 3) request for production, 4) request for admission, and 5) the deposition.After discovery, your attorney will make any final attempts to negotiate a settlement through mediation, where a third party mediates between both sides of the suit.If no settlement is reached, the case will proceed to the trial, where a judge or jury will hear the case and determine whether the defendant is liable for your injuries. Questions? Concerns? Call Taylor King Law Today. We’ve been serving accident victims in Arkansas for more than 20 years. 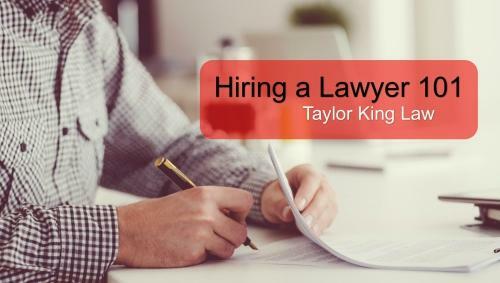 You can trust Taylor King’s team to earn your trust and to help you get the compensation you deserve.Many people are intimidated by the legal process, but our experienced attorneys will answer all of your questions and make the process as simple as possible. With offices across Arkansas, you’re never far away from a face-to-face meeting. We’ll be On Your Side, By Your Side, every step of the way.You can begin with a FREE consultation today. Call Taylor King at 1-800-CAR-WRECK (227-9732) or submit an online form at www.taylorkinglaw.com. Let our experienced team go to work for you!